After unforgettable but exhausting site-seeing in Israel, I decided to take it “easy” and spend my time in Jordan concentrating on only a few places- Petra, Aqaba, Wadi Rum and the capital Amman. 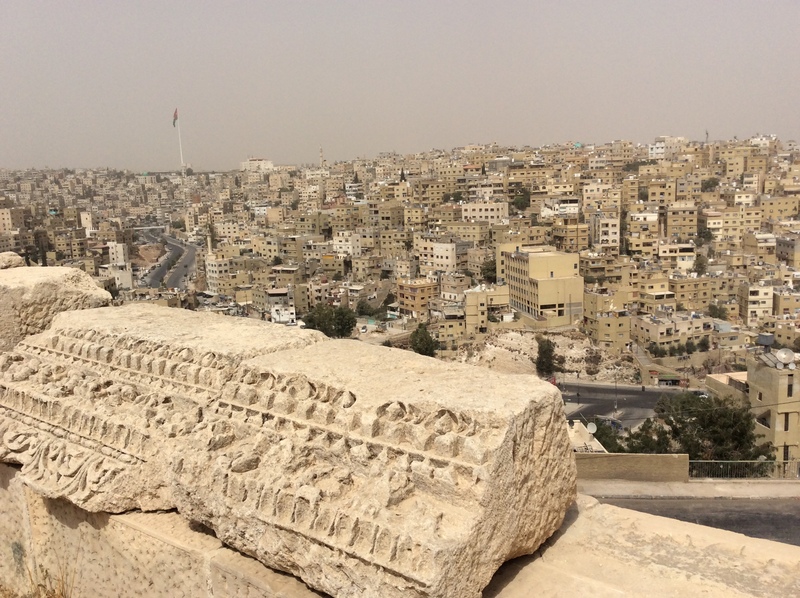 Despite of being surrounded by problematic neighbors, Jordan continues to be a relatively safe and peaceful country that welcomes people from all over the world, including many refugees from the Syrian war. As a female solo traveler, I felt safe at all times, even with the constant and uncomfortable staring from the Arab men on the streets. 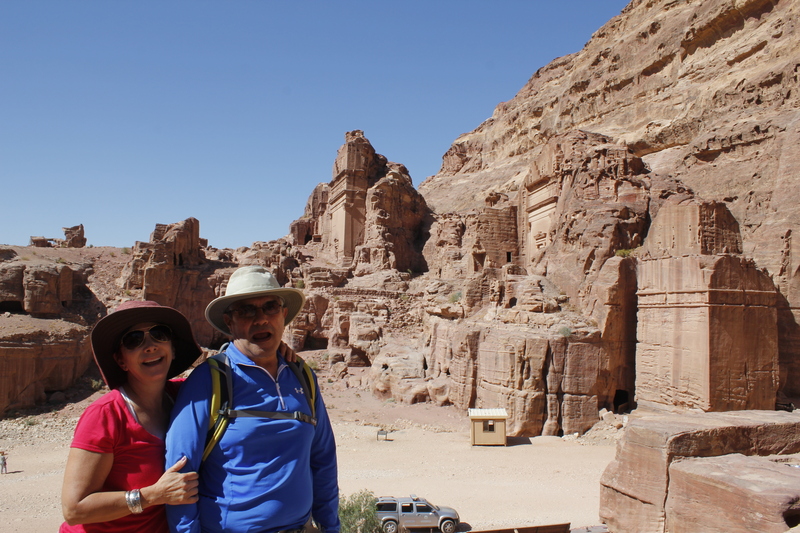 I began by visiting Petra with mom and Alberto for a couple of days. 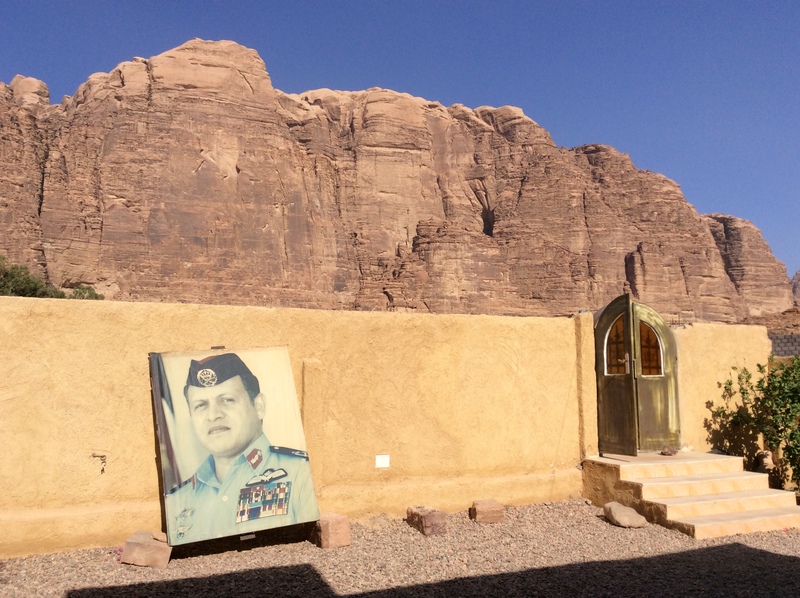 We took a taxi from Eilat in Israel to the border crossing of Wadi Araba in Aqaba, Jordan. It was my turn to see the Israeli officer at the window to exit the country. When I handed my passport a piece of paper that was tucked inside its pages flew inside her office; which she had to pick up off the floor. This upset her so much that she decided to ask for my Colombian passport to get back at me. I am pretty sure of this because she never asked mom and Alberto for theirs. Thankfully I have been traveling with both passports. Who knows if she would have let me in without it. The Jordanian officers on the other hand were very nice and friendly and gave us a big smile as they welcomed us into their country. After the entry point we had to go through a duty free shop where they gave us a free US$10 voucher. I ended up getting some shampoo and toothpaste and only paying $1 for the difference in price. Who would have thought that you could buy your toiletries right at the border. 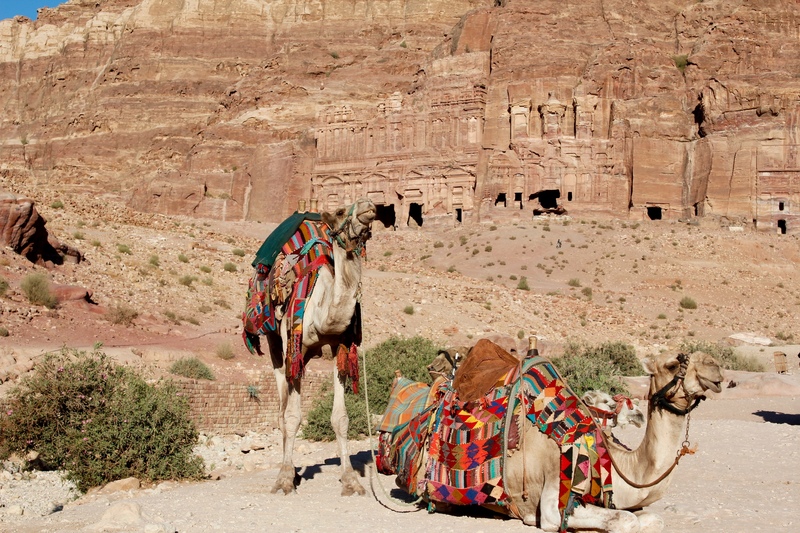 Jordan greeted us with spectacular mountains, deep canyons and our first sightings of camels. It was a vast empty dessert on either side of the road, sometimes with sightings of shepherds tending to their sheep and Bedouin (dessert nomads) tents. Our driver Ayman was a very sweet and knowledgeable man who acted as a tour guide telling us all about Jordan, its history, and past. If you are going to Jordan, I highly recommend him, just send me a private email. Our hotel was located at the top of the hill just above Wadi Musa (Valley of Moses), the town from where people access Petra. Our first stop after checking in at the hotel was of course the magnificent city and important archeological city of Petra, a UNESCO World Heritage Site since 1985. 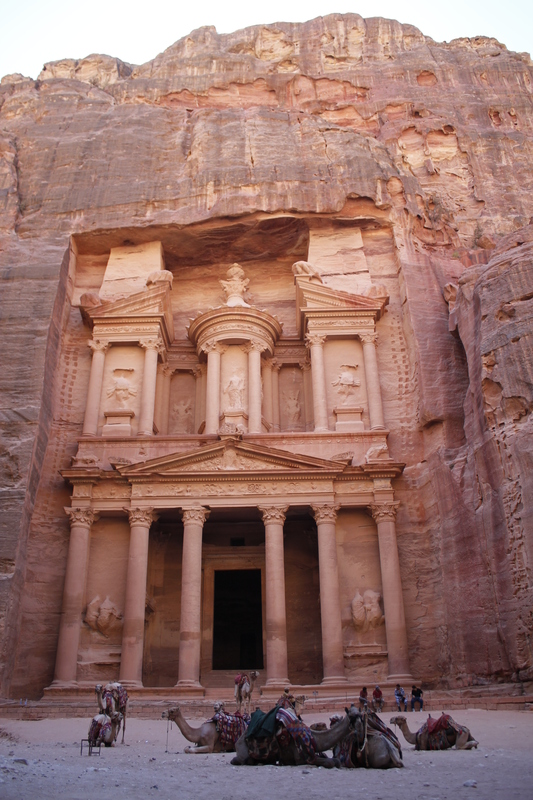 This ancient city of the Nabataeans dating back to 312BC is also one of the new seven wonders of the world. Words cannot describe the beauty of this place with its magnificent geology of sandstone rock and deep gorges and canyons. We spent two days admiring the different highlights as shown in the pictures. The town of Wadi Musa; which we visited for a quick lunch before entering Petra. The dramatic view of The Khazneh or the Treasury from the Siq. A bedul Bedouin girl showing me the view of the valley from above. I met Marguerite Van Geldermalsen, the author of “Married to a Bedouin”. She owns a souvenir stand in Petra. That night I found out that my tenant has been having issues with the AC and my property management company is not handling things in a timely or professional manner. I felt stress for the first time in the four months that I have been traveling. Hopefully the issues will be fixed soon… it is no fun worrying about such things when I am in the middle of the Jordanian dessert and I can’t do anything about them. In the hotel we noticed all the tourists were men and mostly Arab. There are hardly any Western tourists here at the moment, it seems a lot of people have been turned off on visiting the Middle East since the Arab Spring of 2011. It seems Jordan didn’t gain much from the protests either and they continue to have a monarchy, however, Jordanians seem to respect and love their King Abdullah. You see pictures of him on the streets and in most businesses. Mom Alberto and I said our goodbyes at the border and I continued with our driver/guide Ayman to Aqaba City. Mom departed a bit worried to leave me here on my own. There weren’t many tourists around so she was understandably concerned. I arrived to Aqaba City where I stayed at a nice hotel with views of the mountains to the East and the Red Sea to the West. I didn’t do much there since I seemed to be the only woman (and Westerner) walking around during the day. I just went for a stroll to get cheap local food and fresh juice and to see the beach. The city was nice, it definitely had a lot of signs of growth as a lot of buildings were under construction. There were some nice chain hotels on the west side of the city, right on the beach. Jordanians seem to be very devout Muslims, always praying. Despite all of the staring, everyone seems to be very respectful and nice. I decided to spend a few days in Jordan to relax and chose Aqaba South Beach to do it. This was about nine kilometers south of Aqaba City. I also decided that it was the perfect time and place to try diving again. This time I would not do a “discovery dive” but I would train to get my open-water diver certification. If you remember from my post on Malaysia, this is a huge deal for me as I am afraid of deep water with currents. But I am adamant about facing this fear and getting this certification once and for all! I ended up booking the course at Darna Village Hotel & Diving. On my third day in Jordan, Abed, the Diving Manager from Darna picked me up at the hotel with another student Ahmad from Aqaba. The resort is owned and managed by a very nice family, the father and his sons Abed, Fadi and Madi and their friend Ricard and other employees. They take care of everything from the daily management activities, to the cooking, cleaning, and the diving instruction. I met a super nice girl Susan from the Netherlands who has been coming to Darna Village for four years in a row. She also got certified here and knows the family very well by now. She helped me make sense of some cultural differences that I had a bit of a hard time with and gave me some advise on the mask skill. I am very proud to say that I passed the course and I am now a certified open-water diver! I am able to dive in the ocean to a depth of 18 meters (60ft). According to Abed, I was also the only one of his students to ever get 100% on the final test. What a nerd I am! I always thought of myself as well prepared to understand other cultures; after traveling for so many years to different places. The Middle East is a bit different though, especially when it comes to females traveling in Arab Muslim countries. When I first arrived in Jordan, I had a bit of a hard time understanding the men and how they react to foreign women and also the way they spoke to me. I found that when I smiled at people, they didn’t smile back easily. And if you smile at a man, he may think that you are interested in him. When they speak Arabic it sounds as if they are upset with you. Arabic can sound a bit harsh and I think this may be because of how the “h” is pronounced, the sound comes from the throat. When people at the dive resort spoke English to me, they did it in a way as if they were still speaking in Arabic; they were loud, direct and their responses to my questions almost seemed cinic. I learned fast that this was just the way they communicate and they were actually being nice. In Aqaba City, I had a hard time with the constant staring, some men look you up and down like you are a piece of meat. I know this happens everywhere in the world but it made me feel especially uncomfortable here as I noticed they don’t do this with the Arab women, well, probably because they are fully covered. I did notice that when I wore my head scarf I was ignored. No offense to anyone out there reading this, these are simply some personal observations. It took me a few days to realize that people here are actually very nice, polite, and hospitable. 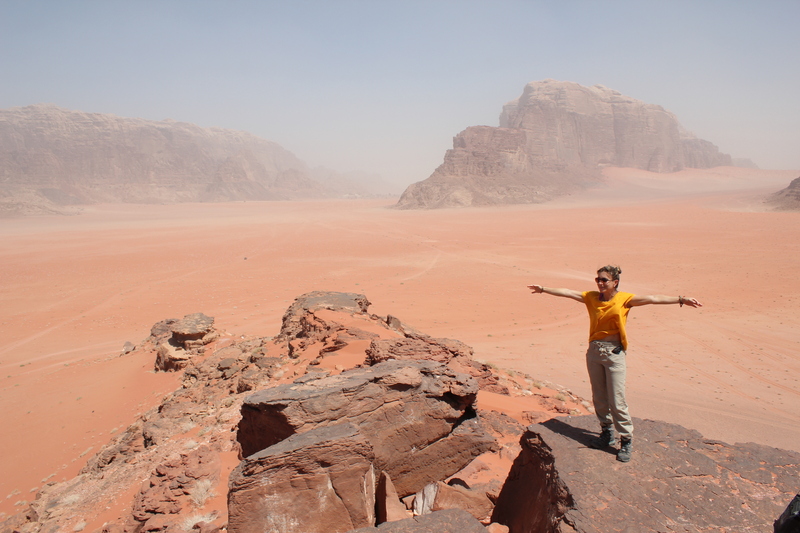 After I got my PADI open-water diver certification I took a couple of days off to go to the dessert and see Wadi Rum. 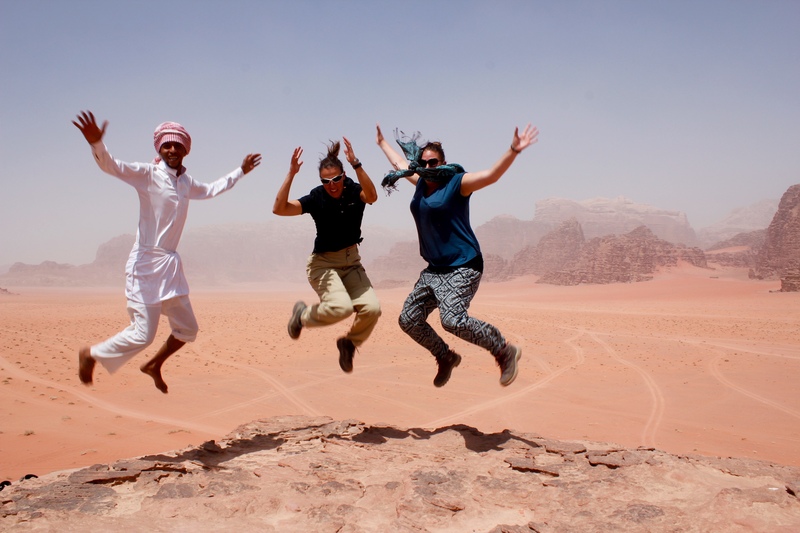 At the office in Wadi Rum village I met Saleem, the owner of the company that would lead us into the dessert, and the two Dutch girls that would accompany me on this trip, Laura and Natasha from the Netherlands. Saleem explained the route and off we went in a 4×4 with Atallah, our Bedouin guide. The dessert is extremely beautiful; it was made famous by TE Lawrence in his book the Seven Pillars of Wisdom. He is well known from the Lawrence of Arabia film based on his involvement in leading the Bedouins in the Arab Revolt against the Ottoman Turkish rule (1916-1918). We visited the Lawrence’s Spring, a water spring named after him, the red Sand Dunes area, the Burdah Rock Bridge, the Burrah Canyon, the Um Frouth Rock Bridge and Lawrence’s house among other sites. We also witnessed an amazing sunset at one of the preferred sunset locations. Our camp was in the Um Fruth area, located against an amazing tall rock mountain. We had a large seating area around a fire pit, hot showers and western toilets, and nice large tents with actual beds in them. This was luxury “camping”! This place was truly majestic and peaceful; it was the first time that I actually got to experience real silence. The cook at the camp made an amazing dinner for us called Zarpe. A traditional meal of chicken, potatoes, vegetables and rice all cooked under sand. Saleem the owner would visit us at night and delight us with beautiful music, played on his alood, of traditional Bedouin stories of love and the dessert. The first day we were lucky to have very good weather. A sand storm not seen in over 30 years came in on the second day and filled the air with dust for the next three days. 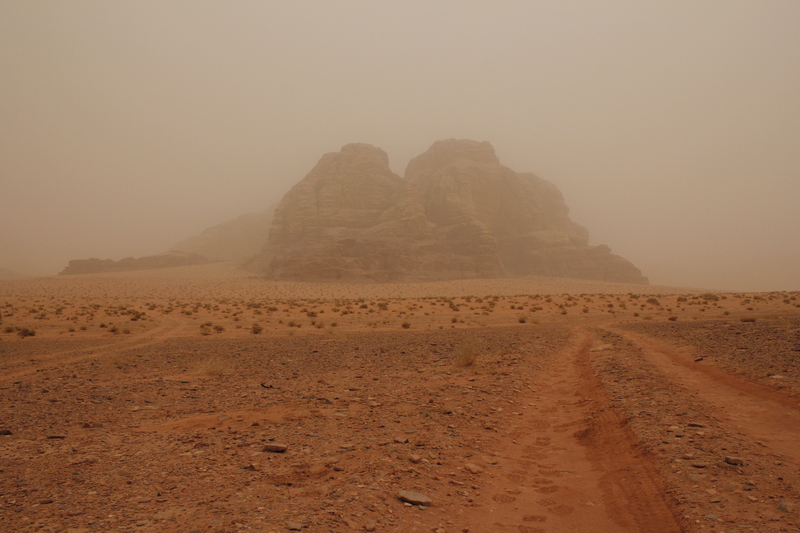 We hiked to the second highest peak in Wadi Rum but the views were very hazy. 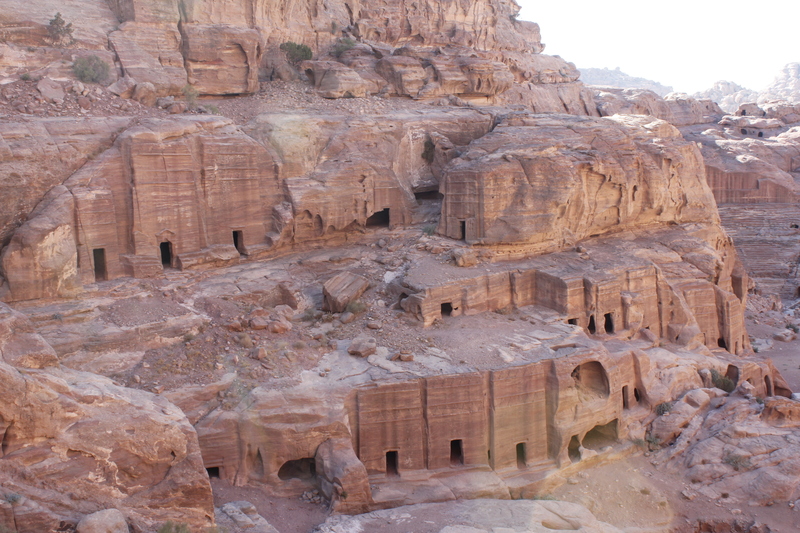 I was very surprised to find out that Marguerite (from one of my Petra pictures) was not the only Western woman that had married a Bedouin and moved to the dessert to live in a cave. We also met Stephanie, a Parisian girl with her husband near our camp. 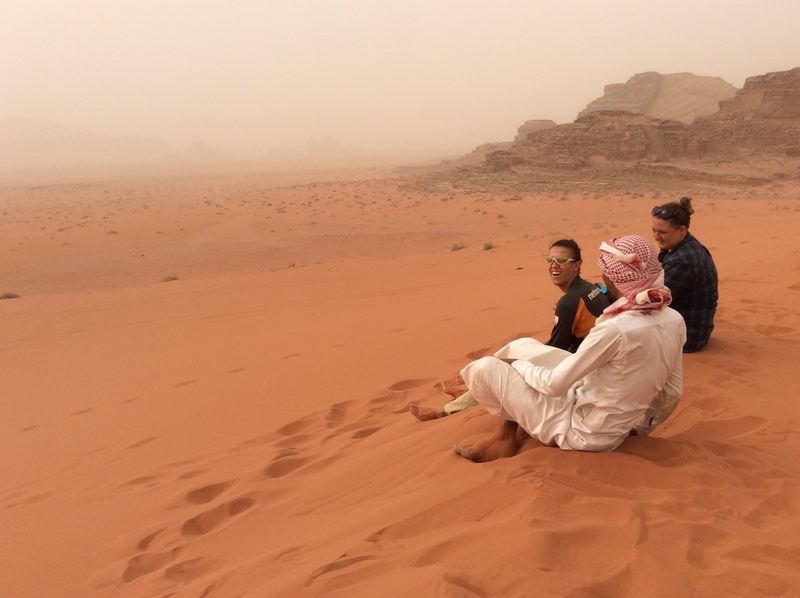 She had come to Wadi Rum as a tourist two years before to go on a six-day horse trip with a Bedouin and others and ended up falling in love with the Bedouin. They kept in touch and she returned to Wadi Rum to marry him. They are friends of Saleem and we went to visit the place where they kept their sheep. We spoke to her as she waited for her husband to put the sheep away for the night. I also found out that Saleem is married to a French woman. Although it would be a difficult life change (at least for me), I can definitely see how very enticing, beautiful and romantic this location can be and how it can lure anyone to live here, even if just for a short period of time. I can honestly say that I am sad to leave this beautiful country. I am in love with its simplicity of life, its dessert, its people and its food! I will be back here to see more of it in the future! SHUKRAN JORDAN! Loved this blog!! Cuando hablabas de como te sentias con las miradas de los hombres jajaj me recordo tanto cuando estaba en Abu Dhabi. Yep y cuando te cubres, te miran menos…un circulo vicioso. Que bueno que saliste saludable del desierto…. I love your blog daughter, it is so fascinating to see the way you describe and make us live part of your joy. God bless you. Wow! Maybe the most spectacular pictures so far!!! Your picture of the Chicken Rock and How Camels Clean Themselves are National Geographic cover worthy! Keep writing. I love reading about your adventures. If it were anywhere else in the Middle East other than Jordan, I would really be afraid for you walking around as a single woman. Congrats on getting your C card for diving. It will open up a whole new world. Hopefully you didn’t gain too much weight having dessert so often in the desert!! LOL. If you are in Egypt let me know I have a brother there. and surprisingly I have not gained any weight, probably because I sweat like crazy in the dessert heat!